Last month I was pretty harsh in my analysis of the Grandstream UCM6100 and on top of the open source issues and burning their partners, it also had some security issues. Well, Ward Mundy has a new report on the UCM6100 and he is impressed with the response Grandstream has had to the community's concerns. He writes, "The short version of this story is Grandstream has addressed most of the open source issues and they’ve resolved well over a hundred bugs. In addition, they’ve published excellent documentation on the PBX in addition to a tutorial on how to interconnect the UCM6100 with other devices including FreePBX®-based Asterisk servers such as PBX in a Flash. So we are pleasantly surprised by Grandstream’s efforts to address many of the concerns that were raised by some of us in the open source community." The silver lining may very well be the functionality boost you’ll get from the addition of a $100 OBi202 device with a Bluetooth adapter.1 This dynamic duo provides turnkey Google Voice support plus Bluetooth cellphone integration which means your cellphone becomes a transparent component in your PBX. When you’re in the office, calls to your cellphone can be managed through the PBX. When the Internet dies, outbound calls from users of the PBX can be routed out through your cellphone. Using your cell phone as an emergency trunk line is very cool. Read the whole post to get Ward's full thoughts. 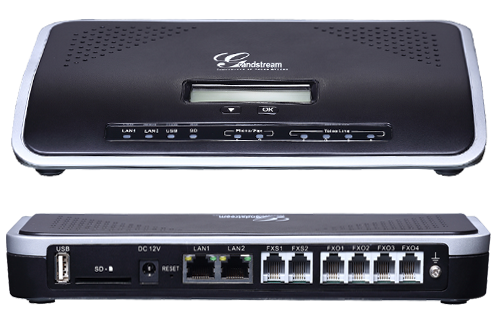 I believe Grandstream is exhibiting at ITEXPO Las Vegas, so I'm going to stop by their booth to get some more thoughts on the UCM6100 product line.